Conceived as a Bogart & Bacall hybrid horror movie, this modern-set curio has a noir-ish emphasis on smoky rooms, methodically uncovered secrets and old-school snappy dialogue. Newspaper reporter Jessica Lowndes talks and looks like she’s from another era, she drives an old car and her unlikely partnership with cop Joe Anderson strives to have the dynamic of a Howard Hawks pairing. Sadly, someone forgot to order some chemistry. The family of Lowndes’ sister are brutally murdered in a harrowing home invasion sequence, and her investigation uncovers the systematic removal of “murder rooms” from this and other homes over the decades. The absorbing, dread-laden first half suggests Bousman might be successful in his attempt to pull off a 21st century ANGEL HEART-esque, noir-infused American Gothic. Sadly, despite striking turns from character actors like Michael Pare, Lin Shaye and Dayton Collie, it loses its way, taking refuge in LOUD, gratuitous jump-scares and underwhelming CG ghosts. Lowndes’ performance is better than her under-written character deserves, just as Collie’s articulate, polite collector of tragedies is a potentially fascinating antagonist. 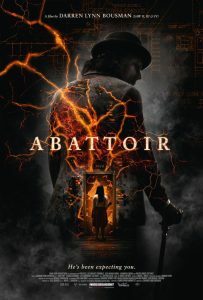 Once it has unveiled its (admittedly striking) visual centrepiece of the “collected” murder rooms, however, ABATTOIR quite clearly has nowhere to go. Lonely pudgy loser Johnny Galecki is still hung up on the fiancée who dumped him years earlier, taking comfort in chocolate after losing his job. At a loose end, he checks out the “Let’s Get Pure” company and ends up as one of four volunteers attending their “cleansing” course at a woodsy retreat, where strange, cute creatures in their likeness emerge from their bodies as part of the physical and psychological process. An understated satire with sincere character beats and an exceptional cast: Oliver Platt, Kevin J O’Connor and Anjelica Huston are veteran scene stealers, for sure. 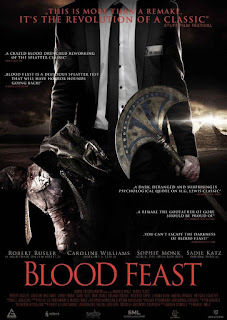 The movie appears to be building up to some kind of a rampage, but instead bows out with a thoughtful, cerebral resolution that suits its low-key, not overly quirky tone. 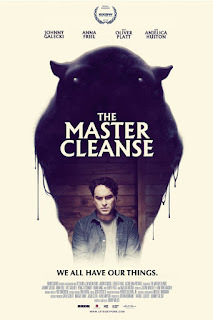 Excellent old-school creature FX bring its slug-like, bug-eyed critters to life in a pleasing homage to post-GREMLINS Amblin-era genre movies, though it’s ultimately too slight to be particularly memorable. “At the Rezort, we firmly believe every apocalypse deserves an after party…” A high-concept, WESTWORLD-influenced flick from the director of the OUTPOST movies, this unfolds in a world moving on from the zombie outbreak that left over two billion dead. 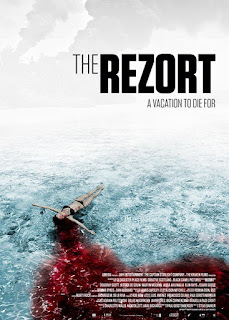 The suitably frosty CEO of “The Rezort” proclaims herself to be a “businesswoman in a world with new priorities”, and presides over a sun-drenched island paradise that employs the remaining living dead and allows paying guests the chance to destroy them for sport. In the mould of the film’s key influences, system failures result in chaos and carnage. This lively picture has some novel 21st century riffs on familiar thematic territory, including the presence of an undead rights activist and the timely, underlying theme of a massive corporation profiteering from the deaths of thousands of “refugees”. It also strains for profundity in sub-Romero scenes of characters pondering over the parallels between “them” and “us” while indulging in second-hand platitudes like “We won a war but somehow lost ourselves…” It’s better when delivering the slickly handled zombie scenes we all signed up for, though too bad the characters are so one-note, with Dougray Scott sleepwalking his way through his monosyllabic zombie-hunter leading role. A loving pastiche of 80’s horror, in which brothers Graham Skipper and Chase Williamson reunite at their Dad’s old video store, puzzling over his mysterious disappearance and uncovering an old board game, “Beyond the Gates”, in the process. 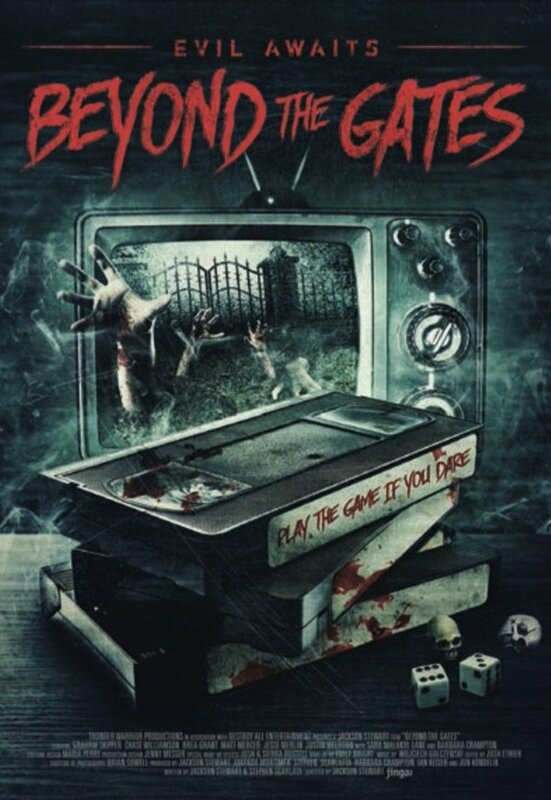 The game’s accompanying VHS was the last thing Dad watched before he vanished, and soon the siblings, and Skipper’s comely girlfriend (Brea Gates), are drawn into the kind of interactive game where the creepy hostess (Barbara Crampton) tells players off for not reading the instructions. A witty, inventive contribution to the current wave of VHS nostalgia, this is a wonderfully evocative retro-chiller anchored by the genuine chemistry between the charmingly naturalistic Skipper and Williamson. The iconically cast Crampton (paying homage to Barbara Steele) and scene stealing creepy antique shop-keeper Jesse Merlin (channeling Roddy McDowall and Christopher Lee) offer a nostalgic, deliberately arch counterpoint. Writer-director Stewart truly understands the tropes of the period, while unselfconsciously paying tribute to the movies he clearly loves: the unusually emotional scenes between the brothers echo PHANTASM, while THE GATE is an obvious influence. Best of all, it looks and feels like a really good 80’s horror movie, with great use of colour, authentic camerawork, appropriate pacing, a stirring electronic score by Wojciech Golczewski and show-stopping practical gore FX. The endless cycle of sequels, prequels, remakes and spin-offs of THE GRUDGE and RING franchises leads inevitably to the kind of contrived franchise mash-up that became fashionable in the wake of FREDDY VS JASON. It’s an inoffensively gimmicky, teen-pitched shocker, though the sell by date of either concept has long since passed, and it’s sad to see the filmmaker responsible for one of the greatest modern J-horror films (NOROI: THE CURSE) reduced to helming this one. The Sadako tape, now entrenched as a typical late 90’s urban legend, is accidentally discovered by a pair of students when they buy an old VCR; their unleashing of the RING curse coincides with a new batch of young people foolishly wandering into the notorious Kayako residence. A leather jacket-wearing young mystic and his blind juvenile sidekick theorise that the only solution to these seemingly inescapable curses is to pit the two evils against one another. Awkwardly replacing the iconic, avant-garde original “Ring” video with something far more generic, the film offers a bizarre attempted exorcism, familiar scares with CGI hair, silly dialogue and an exposure of the limitations of both Sadako and Kayako. Before it totally degenerates into the absurdity suggested by the title (plus a poor high-speed reprise of RINGU’s greatest fright), there is some nostalgic pleasure to be had from watching Kayako doing her old crawling-down-the-stairs-croaking routine and Sadako performing her usual lank-haired shuffle. And Toshio? You guessed it – still lurking in cupboards miaowing. Frightfest 2016: Day Two reviews here.